actually, part of the Battle of the Bulge, so I was interested in a Christmas story involving WWII. I should have known that I'd be disappointed, knowing that Gilbert Morris is a well-known author of Christian fiction. 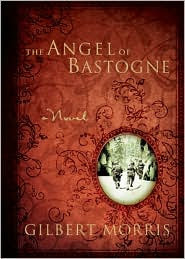 The Angel of Bastogne actually has a very simple storyline. Willie Raines was a Sergeant at Bastogne on Dec. 25, 1944, and when his small squad of five was pinned down by mortar fire, he saw a Lieutenant who gave him advice. Willie took our the mortar squad, and swore it was an angel who guided him. But, Willie's son, Ben, had no childhood. Willie's injuries didn't allow him to do much work, and Ben ended up helping in the family newstand. He became a writer for a newspaper, resentful of his father, who was in the Veterans' Hospital. When Ben's planned vacation to Spain was cancelled, he was given the assignment of writing the paper's Christmas story, and he decided to write about his father's squad, planning it to be a cynical piece. It took the daughter of one of the soldiers, and trips to visit the others, to change Ben's opinion of his father, and of Christmas. It's a simple story, with a tear-jerker ending. My problem with the story was one that many people won't have. I didn't care for the story of Ben's salvation, and the preaching in the book. And, I had never thought of It's a Wonderful Life as a "Godless movie." Loved the WWII angle. I could have lived without the preaching. The Angel of Bastogne by Gilbert Morris. B&H Publishing Group, ©2005. ISBN 9780805432916 (hardcover), 156p. I'll probably pass on this one because I like my inspirational messages to be a little more subtle. Thanks for the review. I'm with you, Elizabeth. And, there's nothing subtle about the message in this book. I'd pass, too, if I were you. A shame..it sounded interesting until you got to the heavy handed part. That WWII part was why I picked it up, Caite. And, since I hadn't read Gilbert Morris before, I didn't realize how heavy handed his book was going to be.